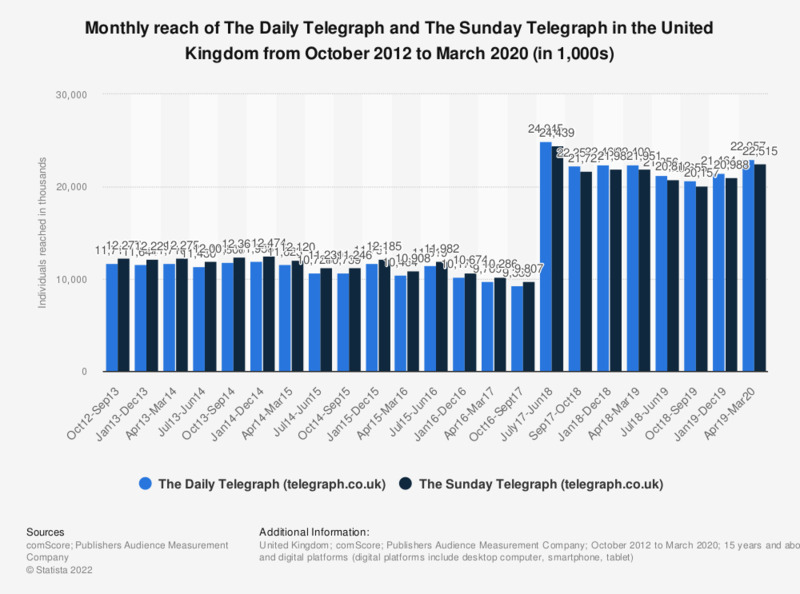 This statistic shows the print and digital reach of The Daily Telegraph and The Sunday Telegraph in the United Kingdom (UK) in selected months from October 2012 to December 2018. In the months from January 2018 to December 2015, nearly 22 million individuals were reached by The Sunday Telegraph or its website. * The source provided the additional information: "Net reach of the title across printed and digital format." Refers to readers and visitors. Figures for months previous to September 2014 are "website visitors," while figures from October 2013 to September 2017 are specifically "PC visitors" Figures for digital reach in June to December 18 include reach through phone, tablet and desktop. The website telegraph.co.uk is not specific to the one print title but a portal or website serving more than one title. Figures for both print titles have been provided here. Figures for months previous to June 2018 were published earlier by the source. For more information on the methodology of this survey click here. Everything On "Newspaper industry in the United Kingdom (UK)" in One Document: Edited and Divided into Handy Chapters. Including Detailed References. Statistics on "Newspaper industry in the United Kingdom (UK)"
Thinking specifically about daily newspapers, which of the following do you use for news nowadays?